If validated when the official results are released on 12 April, this marks a resounding defeat for the Brussels-led conspiracy to pursue Russia-bashing policies of sanctions and information war without consulting public opinion at home. To change metaphors and speak in terms of Dutch folklore, it is the crack in the dam many of us have been waiting for, the opportunity for common sense to prevail over the illogic, hubris and plain pig-headedness of those who control the EU institutions in Brussels, and afar from Berlin and Washington. 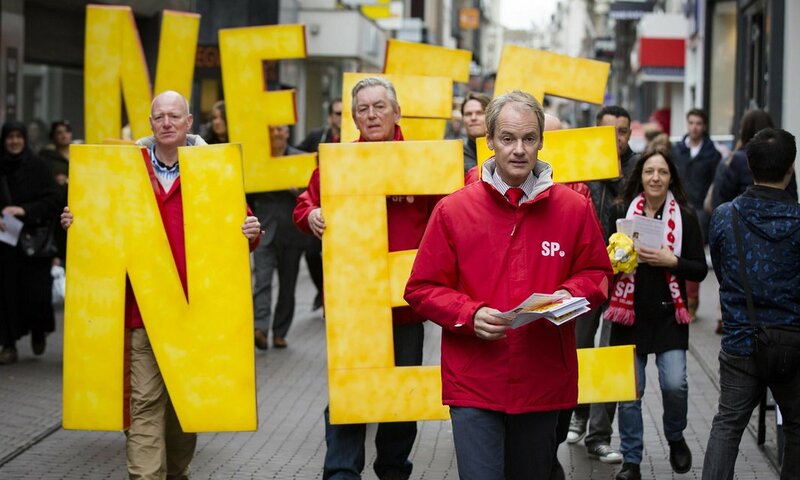 While the referendum was formally just 'advisory,' both the public statements of parliamentarians and the acknowledgements of the Dutch government ahead of the voting indicated that it will force a new vote in parliament on ratification and likely send Prime Minister Rutte to Brussels hat in hand, requesting a renegotiation of the Association Agreement. As such, it may bring the EU foreign policy machinery to a shuddering halt and open the illogic of all the Union's policies towards its eastern borderlands these past several years to public scrutiny and, hopefully, to revision. However, whether this was the decisive moment when the EU is brought to its senses or just the first of a series of knock-out blows directed at the political correctness and group think that has been driving policy ever since the coup d'etat in Ukraine on 22 February 2014, its importance cannot be overstated. We have been hearing for more than a year that the Russia-bashing policies, the sanctions in particular, were opposed by a growing minority of EU member states. Among the dissenters named at one point or another have been Italy, Hungary, Slovakia. Then came Bavaria, within Germany, whose minister-president Seehofer just months ago flaunted the policies of Chancellor Merkel and paid court to Vladimir Putin in Moscow. Just yesterday the president of Austria did the same. And yet, despite all the fine words to reporters about how the sanctions violate the basic economic interests of their countries and of Europe as a whole, none of these statesmen broke ranks when the sanctions repeatedly came up for renewal. The significance of yesterday's event in The Netherlands was that this time the people spoke, not their elected or appointed officials. This was a consultation to remember. In effect, the referendum played out at two levels. At the domestic level, it was a power struggle between the mainstream centrist parties in The Netherlands who stand for ‘go with the flow' on EU decisions and decision-making, versus the Euroskeptic extremes on the left and especially on the right (Geerd Wilders and his Freedom Party) who want to put a stick in the EU machinery and halt the slow-motion, seemingly unstoppable move towards greater union, indeed towards federalism that have gained momentum ever since the onset of the financial crisis in 2008. In that sense it foreshadows the campaign fight of the parliamentary elections that will take place in The Netherlands in 2017. 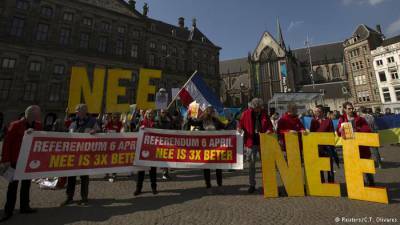 At the same time, the referendum had a geopolitical dimension going way beyond the spoils of office, as a proxy battle between pro-US, pro-NATO versus pro-Moscow ideas within The Netherlands. In both dimensions, the particulars of the EU's Association Agreement with Ukraine that runs several hundred pages long were not the real issue on the ballot. All of which begs the question of what exactly Prime Minister Rutte will eventually be asking the EU Commission to renegotiate. The signs are multiplying that the EU consensus on foreign policy driven by Angela Merkel is nearing collapse. Within Germany itself, her detractors are becoming ever bolder. Earlier this week the German papers were carrying on their front pages news of former Chancellor Helmut Kohl's invitation to Hungarian prime minister Viktor Orban to visit him at his home next week. This is seen as a direct rebuke to Merkel and her policy of open-arms to refugees from Syria and the Middle East, a policy which Orban led a number of new Member States in opposing. The next big test for the European Union, and the next opportunity to deal a severe blow to its complacent leadership in Brussels will be the Brexit referendum in the U.K. at the end of June. Watch this space.